These Thomas A Yorke (1980s) mastered abutments were designed by as an add-on for the ME/Central Valley 150’ Pratt Steel Truss Bridge kit. Obviously, this pair abutments can be used for whatever application needed to cross a ravine, valley or river. Individual blocks are 1/4’ by 7/8” (average). 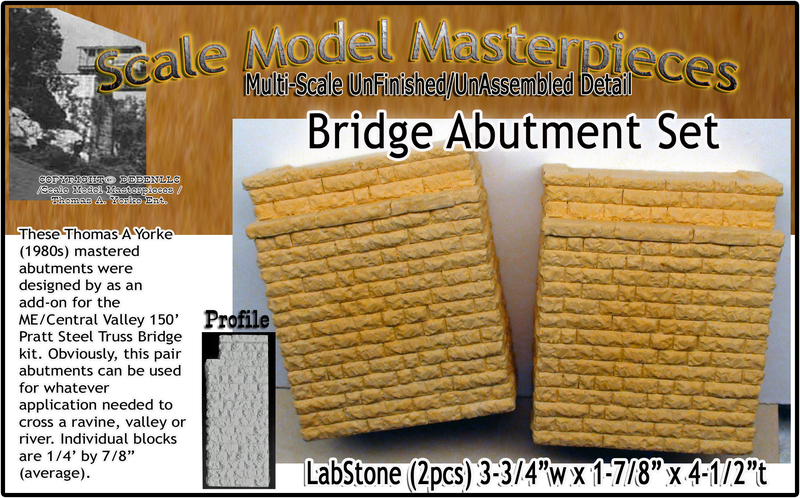 Originally, these Bridge Abutments were cast in solid Hydrocal© weighing over 3 pounds. Now “Hollow-Cast” in high grade LabStone Gypsum our two Abutments weigh less than 2 pounds! And although this original item did not come with instructions, we include our Doctor Ben’s “THE ABCs of Weathering & Staining” HOW-TO #2 4-COLOR. 8-page BOOKLET ($4 Value!) and the easiest ways to stain & color WOOD, HYDROCAL, PLASTIC, & METAL. Coloring & Weathering techniques are recommended using Doctor Ben’s Weathering & Stain Products! SEE Below!